This article is about known objects beyond Neptune. For hypothetical planets, see Planets beyond Neptune. A trans-Neptunian object (TNO), also written transneptunian object, is any minor planet in the Solar System that orbits the Sun at a greater average distance than Neptune, which has a semi-major axis of 30.1 astronomical units (AU). Typically, TNOs are further divided into the classical and resonant objects of the Kuiper belt, the scattered disc and detached objects with the sednoids being the most distant ones. [nb 1] As of October 2018, the catalog of minor planets contains 528 numbered and more than 2,000 unnumbered TNOs. The first trans-Neptunian object to be discovered was Pluto in 1930. It took until 1992 to discover a second trans-Neptunian object orbiting the Sun directly, 15760 Albion. The most massive TNO known is Eris, followed by Pluto, 2007 OR10, Makemake and Haumea. More than 80 satellites have been discovered in orbit of trans-Neptunian objects. TNOs vary in color and are either grey-blue (BB) or very red (RR). They are thought to be composed of mixtures of rock, amorphous carbon and volatile ices such as water and methane, coated with tholins and other organic compounds. Twelve minor planets with a semi-major axis greater than 150 AU and perihelion greater than 30 AU are known, which are called extreme trans-Neptunian objects (ETNOs). The orbit of each of the planets is slightly affected by the gravitational influences of the other planets. Discrepancies in the early 1900s between the observed and expected orbits of Uranus and Neptune suggested that there were one or more additional planets beyond Neptune. The search for these led to the discovery of Pluto in February 1930, which was too small to explain the discrepancies. Revised estimates of Neptune's mass from the Voyager 2 flyby in 1989 showed that the problem was spurious. Pluto was easiest to find because it has the highest apparent magnitude of all known trans-Neptunian objects. It also has a lower inclination to the ecliptic than most other large TNOs. After Pluto's discovery, American astronomer Clyde Tombaugh continued searching for some years for similar objects, but found none. For a long time, no one searched for other TNOs as it was generally believed that Pluto, which up to August 2006 was classified a planet, was the only major object beyond Neptune. Only after the 1992 discovery of a second TNO, 15760 Albion, did systematic searches for further such objects begin. A broad strip of the sky around the ecliptic was photographed and digitally evaluated for slowly moving objects. Hundreds of TNOs were found, with diameters in the range of 50 to 2,500 kilometers. Eris, the most massive TNO, was discovered in 2005, revisiting a long-running dispute within the scientific community over the classification of large TNOs, and whether objects like Pluto can be considered planets. Pluto and Eris were eventually classified as dwarf planets by the International Astronomical Union. On Monday, December 17, 2018 the discovery of 2018 VG18, nicknamed “Farout”, was announced. Farout is the most distant solar system object so-far observed and is about 120 AU away from the sun, likely taking more than 1,000 years to complete one orbit . According to their distance from the Sun and their orbital parameters, TNOs are classified in two large groups: the Kuiper belt objects (KBOs) and the scattered disc objects (SDOs). [nb 1] The diagram to the right illustrates the distribution of known trans-Neptunian objects (up to 70 AU) in relation to the orbits of the planets and the centaurs for reference. Different classes are represented in different colours. 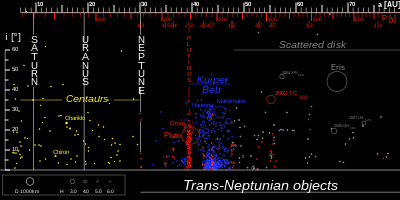 Resonant objects (including Neptune trojans) are plotted in red, classical Kuiper belt objects in blue. The scattered disc extends to the right, far beyond the diagram, with known objects at mean distances beyond 500 AU (Sedna) and aphelia beyond 1000 AU ((87269) 2000 OO67). The Edgeworth-Kuiper belt contains objects with an average distance to the Sun of 30 to about 55 AU, usually having close-to-circular orbits with a small inclination from the ecliptic. Edgeworth-Kuiper belt objects are further classified into the resonant trans-Neptunian object, that are locked in an orbital resonance with Neptune, and the classical Kuiper belt objects, also called "cubewanos", that have no such resonance, moving on almost circular orbits, unperturbed by Neptune. There are a large number of resonant subgroups, the largest being the twotinos (1:2 resonance) and the plutinos (2:3 resonance), named after their most prominent member, Pluto. Members of the classical Edgeworth-Kuiper belt include 15760 Albion, 50000 Quaoar and Makemake. The scattered disc contains objects farther from the Sun, with very eccentric and inclined orbits. These orbits are non-resonant and non-planetary-orbit-crossing. A typical example is the most massive known TNO, Eris. Based on the Tisserand parameter relative to Neptune (TN), the objects in the scattered disc can be further divided into the "typical" scattered disc objects (SDOs, Scattered-near) with a TN of less than 3, and into the detached objects (ESDOs, Scattered-extended) with a TN greater than 3. In addition, detached objects have a time-averaged eccentricity greater than 0.2 The Sednoids are a further extreme sub-grouping of the detached objects with perihelia so distant that it is confirmed that their orbits cannot be explained by perturbations from the giant planets, nor by interaction with the galactic tides. Studying colours and spectra provides insight into the objects' origin and a potential correlation with other classes of objects, namely centaurs and some satellites of giant planets (Triton, Phoebe), suspected to originate in the Kuiper belt. However, the interpretations are typically ambiguous as the spectra can fit more than one model of the surface composition and depend on the unknown particle size. More significantly, the optical surfaces of small bodies are subject to modification by intense radiation, solar wind and micrometeorites. Consequently, the thin optical surface layer could be quite different from the regolith underneath, and not representative of the bulk composition of the body. Small TNOs are thought to be low-density mixtures of rock and ice with some organic (carbon-containing) surface material such as tholin, detected in their spectra. On the other hand, the high density of Haumea, 2.6–3.3 g/cm3, suggests a very high non-ice content (compare with Pluto's density: 1.86 g/cm3). The composition of some small TNOs could be similar to that of comets. Indeed, some centaurs undergo seasonal changes when they approach the Sun, making the boundary blurred (see 2060 Chiron and 7968 Elst–Pizarro). However, population comparisons between centaurs and TNOs are still controversial. Colours of trans-Neptunian objects. Mars and Triton are not to scale. Phoebe and Pholus are not trans-Neptunian. Classical Kuiper belt object (cubewano) seem to be composed of two different colour populations: the so-called cold (inclination <5°) population, displaying only red colours, and the so-called hot (higher inclination) population displaying the whole range of colours from blue to very red. A recent analysis based on the data from Deep Ecliptic Survey confirms this difference in colour between low-inclination (named Core) and high-inclination (named Halo) objects. Red colours of the Core objects together with their unperturbed orbits suggest that these objects could be a relic of the original population of the belt. Scattered disk objects show colour resemblances with hot classical objects pointing to a common origin. While the relatively dimmer bodies, as well as the population as the whole, are reddish (V−I = 0.3–0.6), the bigger objects are often more neutral in colour (infrared index V−I < 0.2). This distinction leads to suggestion that the surface of the largest bodies is covered with ices, hiding the redder, darker areas underneath. Among TNOs, as among centaurs, there is a wide range of colors from blue-grey (neutral) to very red, but unlike the centaurs, clearly regrouped into two classes, the distribution appears to be uniform. The wide range of spectra differ in reflectivity in visible red and near infrared. Neutral objects present a flat spectrum, reflecting as much red and infrared as visible spectrum. Very red objects present a steep slope, reflecting much more in red and infrared. A recent attempt at classification (common with centaurs) uses the total of four classes from BB (blue, average B−V = 0.70, V−R = 0.39, e.g. Orcus) to RR (very red, B−V = 1.08, V−R = 0.71, e.g. Sedna) with BR and IR as intermediate classes. BR and IR differ mostly in the infrared bands I, J and H.
Size comparison between the Moon, Neptune's moon Triton, Pluto, several large TNOs, and the asteroid Ceres. Their respective shapes are not represented. Characteristically, big (bright) objects are typically on inclined orbits, whereas the invariable plane regroups mostly small and dim objects. It is difficult to estimate the diameter of TNOs. For very large objects, with very well known orbital elements (like Pluto), diameters can be precisely measured by occultation of stars. For other large TNOs, diameters can be estimated by thermal measurements. The intensity of light illuminating the object is known (from its distance to the Sun), and one assumes that most of its surface is in thermal equilibrium (usually not a bad assumption for an airless body). For a known albedo, it is possible to estimate the surface temperature, and correspondingly the intensity of heat radiation. Further, if the size of the object is known, it is possible to predict both the amount of visible light and emitted heat radiation reaching Earth. A simplifying factor is that the Sun emits almost all of its energy in visible light and at nearby frequencies, while at the cold temperatures of TNOs, the heat radiation is emitted at completely different wavelengths (the far infrared). Thus there are two unknowns (albedo and size), which can be determined by two independent measurements (of the amount of reflected light and emitted infrared heat radiation). Unfortunately, TNOs are so far from the Sun that they are very cold, hence producing black-body radiation around 60 micrometres in wavelength. This wavelength of light is impossible to observe on the Earth's surface, but only from space using, e.g. the Spitzer Space Telescope. For ground-based observations, astronomers observe the tail of the black-body radiation in the far infrared. This far infrared radiation is so dim that the thermal method is only applicable to the largest KBOs. For the majority of (small) objects, the diameter is estimated by assuming an albedo. However, the albedos found range from 0.50 down to 0.05, resulting in a size range of 1200–3700 km for an object of magnitude of 1.0. For a more comprehensive list, see List of trans-Neptunian objects and List of unnumbered trans-Neptunian objects. (225088) 2007 OR10 the largest object in the Solar System without a name, originally nicknamed Snow white until its color was found to be red. 90377 Sedna a distant object, proposed for a new category named extended scattered disc (E-SDO), detached objects, distant detached objects (DDO) or scattered-extended in the formal classification by DES, nickname "flying dutchman". 136108 Haumea a dwarf planet, the third-largest known trans-Neptunian object, nicknamed santa. Notable for its two known satellites and unusually short rotation period (3.9 h). It is the most massive known member of a collisional family. 2012 VP113 a likely dwarf planet with perihelion 80AU from the Sun (50 AU beyond Neptune), nicknamed Biden. (471325) 2011 KT19 a TNO having an unusual 110° tilted solar orbital plane. (486958) 2014 MU69 the target of the New Horizons spacecraft in a January 1, 2019 encounter, nicknamed Ultima Thule. The only mission to date that primarily targeted a trans-Neptunian object was NASA's New Horizons, which was launched in January 2006 and flew by the Pluto system in July 2015  and 2014 MU69 (commonly referred to as Ultima Thule) in January 2019. Other missions have recently been proposed, including orbital capture and multi-target scenarios. The existence of planets beyond Neptune, ranging from less than an Earth mass (Sub-Earth) up to a brown dwarf has been often postulated for different theoretical reasons to explain several observed or speculated features of the Kuiper belt and the Oort cloud. It was recently proposed to use ranging data from the New Horizons spacecraft to constrain the position of such a hypothesized body. Among the extreme trans-Neptunian objects are two high-perihelion objects: Sedna and 2012 VP113. Sedna and 2012 VP113 are distant detached objects with perihelia greater than 70 AU. Their high perihelia keep them at a sufficient distance to avoid significant gravitational perturbations from Neptune. Previous explanations for the high perihelion of Sedna include a close encounter with an unknown planet on a distant orbit and a distant encounter with a random star or a member of the Sun's birth cluster that passed near the Solar System. ^ a b The literature is inconsistent in the use of the phrases "scattered disc" and "Kuiper belt". For some, they are distinct populations; for others, the scattered disk is part of the Kuiper belt, in which case the low-eccentricity population is called the "classical Kuiper belt". Authors may even switch between these two uses in a single publication. ^ "List Of Centaurs and Scattered-Disk Objects". Minor Planet Center. 8 October 2018. Retrieved 23 October 2018. 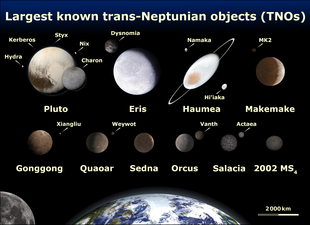 ^ "List of Known Trans-Neptunian Objects". Johnston's Archive. 7 October 2018. Retrieved 23 October 2018. ^ "JPL Small-Body Database Search Engine: orbital class (TNO)". JPL Solar System Dynamics. Retrieved 2014-07-10. ^ "JPL Small-Body Database Search Engine: orbital class (TNO) and q > 30.1 (AU)". Retrieved 2014-07-11. ^ "DISCOVERY OF THE MOST DISTANT SOLAR SYSTEM OBJECT EVER OBSERVED". ^ a b Elliot, J. L.; Kern, S. D.; Clancy, K. B.; Gulbis, A. A. S.; Millis, R. L.; Buie, M. W.; Wasserman, L. H.; Chiang, E. I.; Jordan, A. B.; Trilling, D. E.; Meech, K. J. (2005). "The Deep Ecliptic Survey: A Search for Kuiper Belt Objects and Centaurs. II. Dynamical Classification, the Kuiper Belt Plane, and the Core Population" (PDF). The Astronomical Journal. 129 (2): 1117–1162. Bibcode:2005AJ....129.1117E. doi:10.1086/427395. Archived (PDF) from the original on June 25, 2008. ^ Brown, Michael E.; Trujillo, Chadwick A.; Rabinowitz, David L. (2004). "Discovery of a Candidate Inner Oort Cloud Planetoid" (PDF). Astrophysical Journal. 617 (1): 645–649. arXiv:astro-ph/0404456. Bibcode:2004ApJ...617..645B. doi:10.1086/422095. Archived from the original (PDF) on 2006-06-27. Retrieved 2008-04-02. ^ Trujillo, Chadwick A.; Sheppard, Scott S. (2014). "A Sedna-like body with a perihelion of 80 astronomical units" (PDF). Nature. 507 (7493): 471–474. Bibcode:2014Natur.507..471T. doi:10.1038/nature13156. PMID 24670765. Archived (PDF) from the original on 2014-12-16. ^ a b Peixinho, N.; Doressoundiram, A.; Delsanti, A.; Boehnhardt, H.; Barucci, M. A.; Belskaya, I. (2003). "Reopening the TNOs Color Controversy: Centaurs Bimodality and TNOs Unimodality". Astronomy and Astrophysics. 410 (3): L29–L32. arXiv:astro-ph/0309428. Bibcode:2003A&A...410L..29P. doi:10.1051/0004-6361:20031420. ^ Doressoundiram, A.; Peixinho, N.; de Bergh, C.; Fornasier, S.; Thébault, Ph. ; Barucci, M. A.; Veillet, C. (2002). "The color distribution in the Edgeworth-Kuiper Belt". The Astronomical Journal. 124 (4): 2279–2296. arXiv:astro-ph/0206468. Bibcode:2002AJ....124.2279D. doi:10.1086/342447. ^ Gulbis, Amanda A. S.; Elliot, J. L.; Kane, Julia F. (2006). "The color of the Kuiper belt Core". Icarus. 183 (1): 168–178. Bibcode:2006Icar..183..168G. doi:10.1016/j.icarus.2006.01.021. ^ a b c Rabinowitz, David L.; Barkume, K. M.; Brown, Michael E.; Roe, H. G.; Schwartz, M.; Tourtellotte, S. W.; Trujillo, C. A. (2006). "Photometric Observations Constraining the Size, Shape, and Albedo of 2003 El61, a Rapidly Rotating, Pluto-Sized Object in the Kuiper Belt". Astrophysical Journal. 639 (2): 1238–1251. arXiv:astro-ph/0509401. Bibcode:2006ApJ...639.1238R. doi:10.1086/499575. ^ Fornasier, S.; Dotto, E.; Hainaut, O.; Marzari, F.; Boehnhardt, H.; De Luise, F.; et al. (October 2007). "Visible spectroscopic and photometric survey of Jupiter Trojans: Final results on dynamical families". Icarus. 190 (2): 622–642. arXiv:0704.0350. Bibcode:2007Icar..190..622F. doi:10.1016/j.icarus.2007.03.033. ^ "Conversion of Absolute Magnitude to Diameter". Minorplanetcenter.org. Retrieved 2013-10-07. ^ "Evidence for an Extended Scattered Disk?". obs-nice.fr. ^ Jewitt, D.; Delsanti, A. (2006). "The Solar System Beyond The Planets" (PDF). Solar System Update : Topical and Timely Reviews in Solar System Sciences (Springer-Praxis ed.). ISBN 978-3-540-26056-1. ^ Gomes, Rodney S.; Matese, John J.; Lissauer, Jack J. (2006). "A Distant Planetary-Mass Solar Companion May Have Produced Distant Detached Objects" (PDF). Icarus. 184 (2): 589–601. Bibcode:2006Icar..184..589G. doi:10.1016/j.icarus.2006.05.026. Archived from the original (PDF) on 2007-01-08. ^ Brown, Michael E.; Barkume, Kristina M.; Ragozzine, Darin; Schaller, Emily L. (2007). "A collisional family of icy objects in the Kuiper belt" (PDF). Nature. 446 (7133): 294–296. Bibcode:2007Natur.446..294B. doi:10.1038/nature05619. PMID 17361177. ^ "Distant object found orbiting Sun". BBC News. 2005-07-29. Retrieved 2010-03-28. ^ "MPEC 2005-O42 : 2005 FY9". Minorplanetcenter.org. Retrieved 2013-10-07. ^ Hand, E. (2015-11-10). "Astronomers spot most distant object in the solar system, could point to other rogue planets". News.ScienceMag.org. AAAS. Retrieved 2015-11-11. ^ "Mystery object in weird orbit beyond Neptune cannot be explained". New Scientist. 2016-08-10. Retrieved 2016-08-11. ^ "New Horizons: News Article?page=20190101". 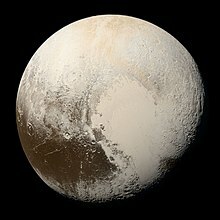 pluto.jhuapl.edu. Retrieved 2019-01-01. ^ Low-Cost Opportunity for Multiple Trans-Neptunian Object Rendezvous and Capture, AAS Paper 17-777. ^ Julio A., Fernández (January 2011). "On the Existence of a Distant Solar Companion and its Possible Effects on the Oort Cloud and the Observed Comet Population". The Astrophysical Journal. 726 (1): 33. Bibcode:2011ApJ...726...33F. doi:10.1088/0004-637X/726/1/33. ^ Patryk S., Lykawka; Tadashi, Mukai (April 2008). "An Outer Planet Beyond Pluto and the Origin of the Trans-Neptunian Belt Architecture". The Astronomical Journal. 135 (4): 1161–1200. arXiv:0712.2198. Bibcode:2008AJ....135.1161L. doi:10.1088/0004-6256/135/4/1161. ^ Lorenzo, Iorio (August 2013). "Perspectives on effectively constraining the location of a massive trans-Plutonian object with the New Horizons spacecraft: a sensitivity analysis". Celestial Mechanics and Dynamical Astronomy. 116 (4): 357–366. arXiv:1301.3831. Bibcode:2013CeMDA.116..357I. doi:10.1007/s10569-013-9491-x. ^ Wall, Mike (24 August 2011). "A Conversation With Pluto's Killer: Q & A With Astronomer Mike Brown". Space.com. Retrieved 7 February 2016. ^ Brown, Michael E.; Trujillo, Chadwick; Rabinowitz, David (2004). "Discovery of a Candidate Inner Oort Cloud Planetoid". The Astrophysical Journal. 617 (1): 645–649. arXiv:astro-ph/0404456. Bibcode:2004ApJ...617..645B. doi:10.1086/422095. ^ Brown, Michael E. (28 October 2010). "There's something out there – part 2". Mike Brown's Planets. Retrieved 18 July 2016. Wikimedia Commons has media related to Trans-Neptunian objects.